Ok, hear me out. This topic may be on the little shallow end in terms of depth of discussion but for new pool owners this subject can be confusing. I have worked at Inyo for years and if I had a nickel for every time a caller described a motor as a pump or a pump as a motor I would have $20,483.15 (probably not an accurate count.) But you get my meaning. It happens a great deal and the miscommunication can cause frustration for both the customer and the technician, so I am here to clear it up. This topic idea came from one of our technicians because it is a consistent misstep that is easily avoided by knowing simple terminology. The source of the issue arises when a customer states he or she is needs a 1 horsepower pump, which sends our tech down a path scanning suitable choices for pumps and matching it to their plumbing needs. The whole process can take five, fifteen or thirty minutes – it all depends on the information on hand. All things are going smoothly until we provide the part number and the customer sees it is a whole pump instead of the pump (electric motor) they were looking for. And then the process starts all over again, following a long sigh from both sides of the phone. And this is a motor. 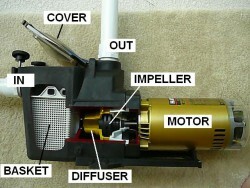 The pump is an assembly made of two separate parts, the wet end and the electric motor. The wet end’s outer component is the housing which is essentially the hull of the pump; it holds all the inner components and the motor bolts to it. The guts of the pump are made up of gaskets, impellers, diffusers, and strainer basket. All these parts make up the wet end but without something to drive these parts they are merely pieces of well formed plastic. The part that makes it come to life is the motor. 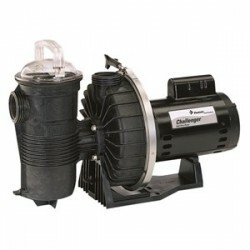 The electric motor is the driving force behind the wet end of the pump, literally and figuratively. The pump’s shaft spins up to 3,450 revolutions per minute to turn the impeller to draw water from your pool and then push it through your filter and back to the pool. 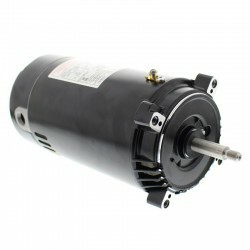 The motor is a cylindrical steel enclosure, usually black but sometimes gold or almond colored, bolted to the back end of the wet end. 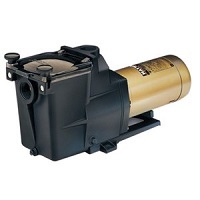 Motors come in three varieties: single, dual, and variable speeds; the latter allows for the most flexibility in terms of pump scheduling and additional water features. The variable speed also provides the most long term savings as it burns less electricity on lower RPM settings and motors can last 3 to 5 times longer than the average life of a single or dual speed motor. Single and dual speed motors are the standard in the industry for now but variable is gaining in popularity. 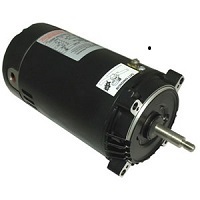 Variable speed motors and newer dual speed motors are made with an attached timer which allows the user to directly program scheduled times into the motor. A sidenote, part of the confusion of “pump or motor” comes from not understanding the motor label but we have thought of that too. Read our How to Read a Motor Label guide to get a better understanding of your pump. 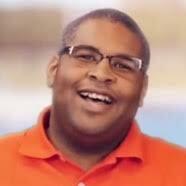 Thank you for reading this blog and if you have any questions about your pool pump or motor, please do not hesitate to call us at 877-372-6038. You can buy Hayward branded motors, but they are actually made by Century. 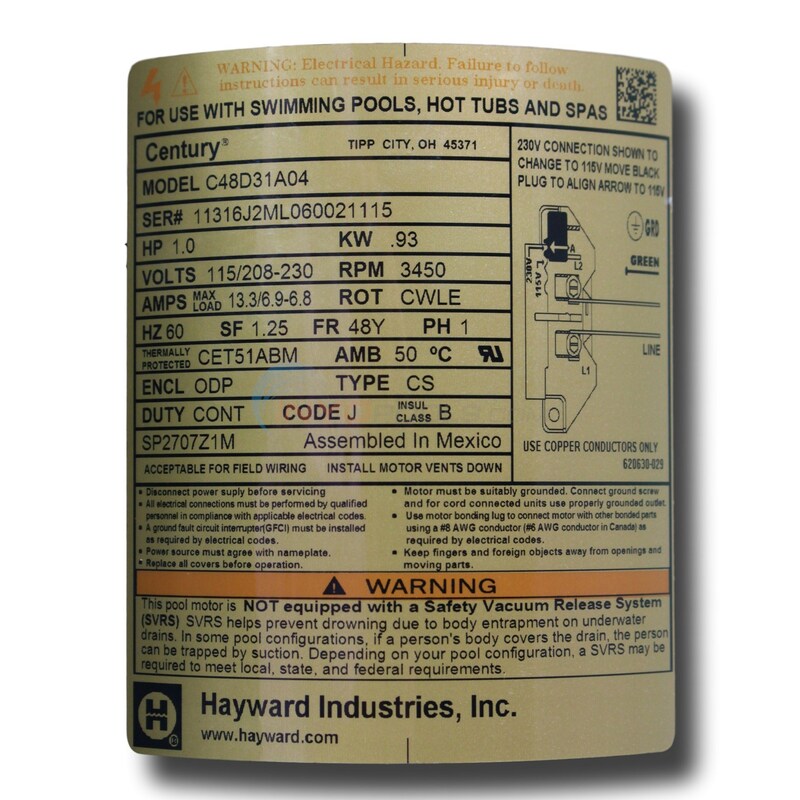 Look at this tag for an example, it has Hayward’s name and logo in bold at the bottom, but you can see they hide Century’s name at the top right. I’m not sure why they do it. I bought an AO Smith motor B2853 and the impellar does not work. I need to find out what impellar works! so the sand thing is totally different? The sand thing is the filter, which is a different unit than the pump. i NEED TO FIND A MOTORSHOP. TO REPLACE A WORK IMPELLER. Suction or Pressure Side Pool Cleaner?